Large-scale deployments of any application to your workforce can be a challenge. A considerable amount of effort is required to coordinate even a small team of 10 to download and configure an app. Now imagine the huge task of setting up an entire workforce of hundreds or thousands. 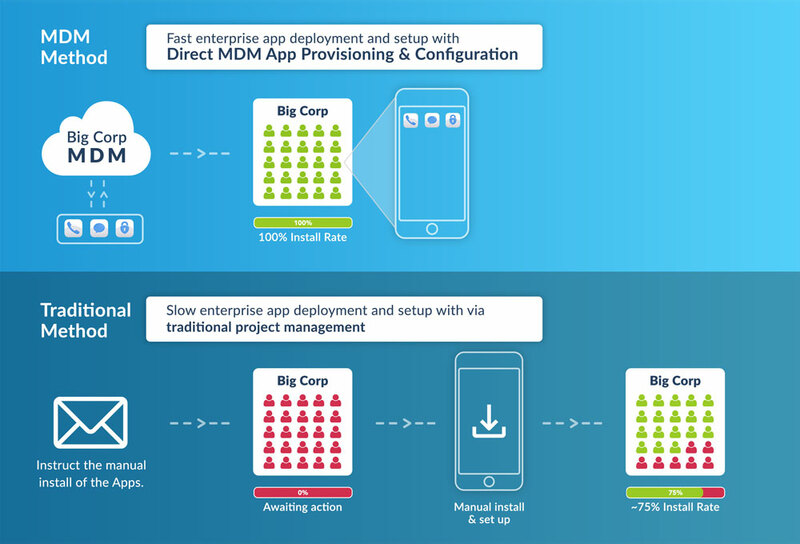 With Norwood’s new Direct MDM App Provisioning and Configuration Service, companies can place the World Apps on the devices of their entire workforce and set a custom configuration over-the-air (OTA). This dramatically streamlines the process of provisioning the app to a large workforce, reducing downtime and coordination efforts. Put simply, an MDM or Mobile Device Management is a cloud or on-premises service used by organisations to manage certain apps or functionalities on employee mobile devices. These devices may be company-owned or employee-owned. Once set up, IT administrators can quickly and easily distribute applications, data and configuration settings over-the-air to the entire fleet. It can also securely serve emails and documents to users connected to its network. Let’s look at a quick example. Big Corp wants to provision its 720 employees with World Secure for Business. The IT team, having realised the daunting task of manually installing the App on 720 employee devices and configuring them correctly, chooses to utilise an MDM platform to streamline the process. This new direct deployment option enables Big Corp’s IT administrators to deploy World Secure rapidly on employee smartphones without the need for employee involvement or interaction with the App Stores. That’s one challenge down. World Secure’s support of MDM deployment made it simple and efficient to get the app onto 720 mobile devices. Provisioning a large team with the App can be considered a one-time task. However, the ongoing task of enforcing cybersecurity policy and responding rapidly to cyber threats is compliance requirement, kept in place to keep company and customer data secure at all times. In the case of increased security threat, rapidly respond and temporarily set World Secure to always keep its VPN on, regardless of connection type. Under the last case, the CIO group or IT admins can implement security features fast and not have to email every employee to change their security settings. There’s also the guarantee that every device is up to date. This latest enterprise product update makes large-scale deployments fast and controlling configurations easy. We’re very excited to offer this to our new and existing customers. Please get in touch with our team to learn more about the solution and more.